For the last week of the spring CSA, Breezy Willow wants to make sure that you eat your vegetables. Look at all those beauties. Hiding in the back there is the largest celery cabbage I’ve ever seen. Leaning up against it, a head of romaine lettuce, a loaf of sourdough bread, a bunch of fresh asparagus (the ends were still moist! ), and a pound of spinach. Closer to the front, there are two bunches of red chard (I traded an eggplant for extra chard), a pile of zucchini, Breezy Willow eggs, and three Vidalia onions. I may have mentioned it before, but let me just say it again: I really love the colors on those Breezy Willow eggs. Last weekend I buckled down and prepped or cooked almost all the vegetables in the fridge, enabling more relaxed weekday evenings. I blanched green beans, cut up Brussels sprouts with garlic to roast in the oven, and sauteed kale, chard, beet greens, and radish greens in butter. I also roasted up all the sweet potatoes that have been biding their time in the back of the cupboard. It made getting dinner on the table really easy this week. Since this is a holiday weekend coming up, I should have plenty of time to put a dent in the greenery crowding our refrigerator. Usually the last week of the summer/fall CSA is a very sad time for me; it ends around the same time as the last of the farmer’s markets, and it means I have to stock up for the winter. The end of the spring CSA, on the other hand, is a happy time. 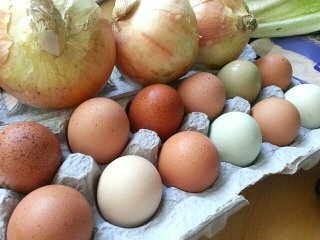 The farmer’s markets are opening, I’m making dates to visit the pick-your-own places, and summer’s bounty is just around the corner… and so is the summer CSA. Oh, and strawberries. Larriland Farm‘s latest email blast said that they plan to open sometime next week for strawberry picking. I am so ready. Casey was saying that the strawberry harvest in North Carolina was hurt by heavy rain, and that ours is relatively late because strawberries need sun to ripen. I enjoy learning these details; it makes me feel closer to the land, and really makes me appreciate the berry harvest when it comes. Speaking of strawberries, the last of the berries from last Sunday’s market were starting to look a little wrinkly and soft, so I cut them up and tossed them lightly with some sugar and a dash of lemon juice. In a jar overnight in the refrigerator, they released even more juices, producing a dark red syrup with chunks of strawberries floating around inside. It’s tart, sweet, and brilliant on ice cream. 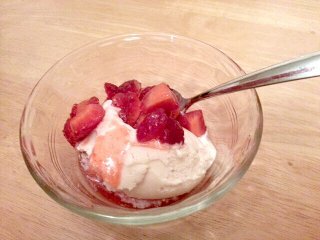 Vanilla works perfectly well, but I’ll take mine on a scoop of Breezy Willow’s strawberry cheesecake ice cream. I think I snapped sometime last week, when I dug yet another tasteless supermarket granola bar out of my work drawer. It tasted like cardboard and chemicals, a mockery of the big chunks of chocolate and round red cherries on the plastic wrapper. I grumpily ate it anyway (I was hungry, after all), but promised myself I would find a better way. On top of the oat base, the recipe calls for 2 to 3 cups of dried fruits and nuts. All we had in the house were Craisins and chocolate chips, so I used 1.5 cups of Craisins, 1/3 cup of chocolate chips, and 1 cup of Rice Krispies cereal to pad things out. They turned out amazing. Yes, even though I messed up and forgot to add the melted butter until the very end (and, in my haste, tried to melt said butter in the microwave and it exploded, leaving greasy streaks everywhere). Anyway, they’re dreamy creations, peanut buttery and oat-y and sparkling with fruits and chocolate. 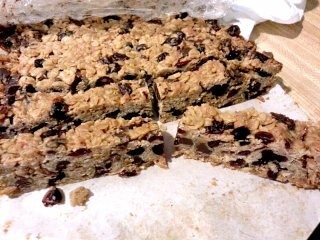 It’s like eating an oatmeal craisin cookie in bar form. We also went to the farmer’s market in Oakland Mills on Sunday. 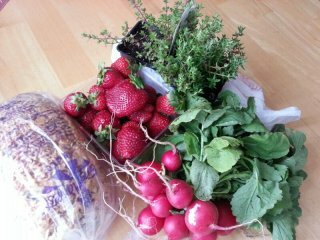 I went for strawberries and bread, and came away with thyme and radishes as well. That’s Popeye bread from Great Harvest (spinach in bread = no guilt about breakfast sandwiches), and both French and English thyme. I’m horrible with plants, but I think if I plant the thyme outside, Mother Nature will take better care of it than I can. And I love thyme on chicken in the summers. The strawberries lived up to my expectations, by the way; they were wonderfully sweet, juicy, and dark red all the way through. Every year, I’m amazed anew by the taste of ripe strawberries. There’s really no comparison to supermarket ones. Since I hadn’t tried the passionfruit macarons before, we got a couple to sample. (Verdict: very sweet, not terribly passionfruity.) And as a bonus, next time I go in there, I’ll get a free cupcake! 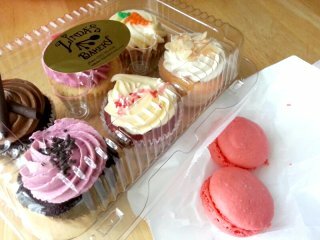 They have a frequent buyer card with which you can get a free cupcake after every 10 cupcake purchases. I’ve somehow miraculously managed to hang onto the same one since I started. On the other hand, I must have five or six frequent buyer cards from Great Harvest floating around the house. Someday I’ll find them all and have a bread party. Anyway, it’s great to live in a place where such good food is so easy to find. 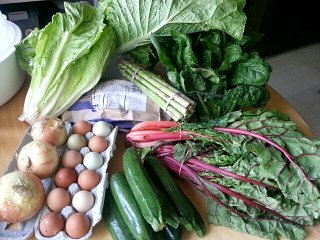 The spring CSA is only 12 weeks long, and then (if memory serves) we’ll get a week off before the summer CSA starts up. So there’s just one more week left. At least the farmer’s markets are open to tide us over. 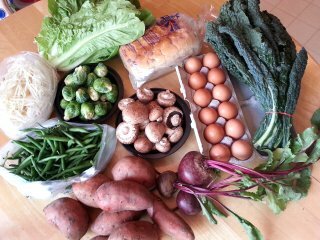 Week 11: Bean sprouts, green beans, Brussels sprouts, cremini mushrooms, romaine lettuce, sweet potatoes, beets, dinosaur kale, eggs, and bread (Great Harvest cinnamon chip). Apparently dinosaur kale is so called because the pebbly texture on its leaves is kind of like dinosaur skin. It does give off a sort of prehistoric vibe. I’m determined to eat the bean sprouts tonight; the last couple of times, I let them sit too long and they turned brown and sad. The romaine will probably get eaten next; a nice crisp salad is always good on warm days like these. Everything else is a good hearty vegetable that can sit in the fridge drawers for a couple of days without too much damage. 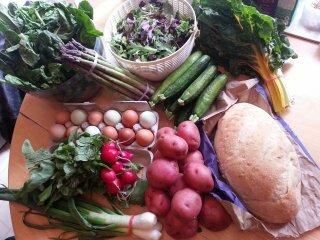 Last week, week 10: spinach, asparagus, spring mix, rainbow chard, zucchini, Breezy Willow eggs, radishes, spring onions, red potatoes, and bread (Great Harvest sourdough). I think we did a good job eating all of these except the poor chard. We sliced and baked the zucchini in the toaster oven, the asparagus got sauteed with some onion, the radishes were pickled (K is delighted with the result, but I am not quite convinced), the spinach and mushrooms went into an omelet (the kid likes vegetables when covered with egg and cheese) and the poor chard is rehydrating in the fridge. I pulled it out to cook a couple days ago and the stems were all floppy. I’m letting them drink up some water; hopefully they’ll get a little more firm. Still nice and colorful, though. As for the spring greens, we had a dinner salad that very night. 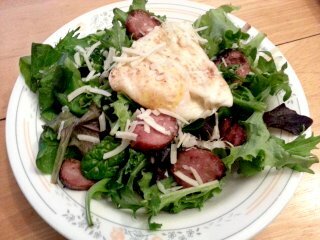 My favorite, with an over-easy egg on top, and some sliced sausage and grated Parmesan to add a little bit of luxury. The past couple of times K’s fired up the grill, I’ve had him throw some sausages on as well. Protein is a time-consuming item to prepare, and I like being able to just whip up some veggies with some kind of carb and then serve it up with sliced sausage. Gets dinner on the table faster in the evenings, and the fat-and-flavor hit of the sausage means you don’t need to eat very much to feel full. I’m not always on top of things in the blogosphere, so I didn’t get the news about Wordbones until I got the HocoBlogs email on Saturday night. It put a damper on what had otherwise been a good Mother’s Day weekend. I’d never met the man in person – I’d never even gone out to any of the HoCo blogging events – but I wish I had. I loved reading his blog. I was very impressed by all of the details that he managed to acquire, and the easy writing style that he used to share what he knew. He really cared about the area, and it came through in his words. It’s thanks in part to him that the HoCo blogging scene has developed into a crazy, wonderful, and close-knit community. I brooded about his death for a while, unsure of what to say, until it finally occurred to me that it would be a good tribute to acknowledge some of the HoCo blogs that I’ve come to love, that I might not ever have found without the community that he helped create. First and foremost is HowChow. I don’t know how he does it, but the guy manages to eat all over the place and find out about everything new that’s coming into town. He’s always open to exploring new tastes and cuisines, and his enthusiasm is contagious; thanks to him I’ve got a thick forest of bookmarks for restaurants and markets all over the area. Whenever we sit down at an area restaurant, odds are that one of us is going to pull out a smartphone and say, “well, let’s see what HowChow ordered…” Reading his posts makes us feel like insiders. I still remember the feeling of excited discovery the first time I bit into the al pastor tacos from R&R Taqueria. And I gotta admit I was over the moon the first time he linked to this blog. ^_^ Thank you, HowChow, for making sure that we eat well. Next, AnnieRie Unplugged. I want to be AnnieRie when I grow up. (Hopefully by then I will also have learned to grow plants without killing them.) To read her blog is to appreciate nature and good home cooking, to glory in the bounty of farms and parks all around us, to delight in beautiful flowers and found asparagus. I’ve already picked up lots of tips and tricks from her blog to prepare meals in easy and delicious ways, and to sock away fresh fruits and vegetables for the winter. I haven’t checked out the Howard County Conservancy yet, but when my kid is older, we’re definitely going on some of those walks. Speaking of the kid, I should mention Do-It-Yourself Danielle. I’ve never commented on her blog, but I read it regularly and with great admiration. I don’t actually know how to use a sewing machine, but someday when I do, I hope to attain a fraction of her skills. Our cloth diapers are store-bought, but if the elastic starts to go, I know where I’ll turn for help. I love her candid stories about raising her son, and since her kid is just a little older than mine, I feel like she’s blazing a trail for me to follow. And for when my kid is older still, I’m storing away knowledge from the blog of Lisa B, Mrs. S. I love the mix of topics on her blog, how tips for keeping kids occupied during a long car trip share space with wide-ranging commentary on the county school system and on society at large. She’s always paying attention to how to make the world a better place for her school-age children, and she does it with a thoughtful, flowing writing style that I just love to read. As for thoughtful writing, there’s plenty to be found on The Rocket Powered Butterfly. He doesn’t post as often, but it’s worth the wait when he does. Each post is carefully crafted, exhaustively footnoted, and often offers me a perspective I hadn’t previously considered. Posts don’t need to be long to be worthwhile, though. 53 Beers on Tap is one of the first blogs that sucked me into the community. This guy pulls no punches and I sometimes find myself disagreeing with what he says, but there’s no doubt that he cares deeply about the area and wants what’s best for everyone. It’s one of my go-to blogs for local politics, with a side of strong opinion. I also regularly check on HoCo Rising for a comprehensive debrief of politics around the county. Tom Coale highlights people and news items that I would probably never have heard of, but am glad to learn about. I have no idea how he gathers all of his links but I’m glad he’s there to distill it down for us. And finally, a world of gratitude to Jessie X, the glue that holds the HocoBlogs community together. When I first hesitantly offered my blog to the HocoBlogs directory, she was immediately welcoming and full of helpful advice. She does a lot of work to keep the community engaged and vibrant. Thank you, Jessie; this place wouldn’t be the same without you. 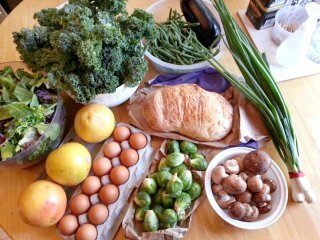 On the table for week 9: spring mix, kale, green beans, eggplant, spring onions, bread (parmesan sourdough), crimini mushrooms (aka “baby bellas”), Brussels sprouts, eggs, and grapefruit. The kale was softer than usual, with pointy edges to the leaves, and I asked if it was a different breed. Casey told me that it was just because the kale was young. I’m looking forward to seeing if they cook up with a more tender texture than normal kale. CSA cooking has been a different experience for me this year. In past years, I haven’t hesitated to try intricate and interesting ways to eat the vegetables, looking up lots of recipes and trying some really time-consuming things in the kitchen. (Like that tomato corn pie that required peeling tomatoes and making from-scratch biscuit crust; it took hours.) This year it’s all about what’s quick. I’ll probably blanch the green beans in the same water as the kale, for the extra time savings. Last night we ate half the salad greens and I roasted up the sprouts to put in our lunch containers. Quick and easy, that’s my goal. It’s because the kid doesn’t want to wait around for dinner. We pick him up from daycare at 6, and when he gets home, he expects to eat; the less time we spend cooking, the better. After dinner, we play around until his bathtime after 8, and by 9 he’s usually in bed… and that’s when I do the cooking, as quick and clean as possible so I have some time to relax before bed. Tonight after he’s down, I’ll probably get the beans and kale blanched, and I might even clean up the mushrooms and spring onions and get them into some kind of frittata form. Or I could stir-fry them up with the eggplant. I just need something that’ll reheat easily when we come home with a hungry kid at 6pm. Thank goodness he eats practically anything that we’re eating. (Last night he even sniped some salad greens from my plate.) I prepare his food the same as ours, except I cut it in smaller pieces. Please, please let him stay an omnivore as long as possible. Anyway, this focus on quick-cooking technique is only temporary (most stages are, with the kid), and I gotta say that I’m really looking forward to cooking with the kid once he’s actually old enough to help out in the kitchen. But right now he’s just learning to walk and handle a fork, so it’ll be awhile yet. At least, with all these beautiful veggies, I know I’m feeding him well.